Zipcar unclear on the concept? Zipcar would have done wonders for my life during the time I spent in a small Western city where the buses stopped running at 8PM and there were lots of things worth seeing out beyond where the buses went. In New York it just seems bizarre, but then again it's bizarre that anyone would want to drive anywhere here, let alone actually own a car. Be that as it may, if there's anywhere you might want a car handy, it would be Ikea. Especially since, unlike the sane furniture companies (Gothic Cabinet Craft, for instance), Ikea offers no reasonable delivery service. Judging by a quick Google search, there are several small businesses that do nothing but deliver furniture from Ikea. I solve that problem by simply buying my furniture at Gothic or some other reasonable place, but some people want to shop at Ikea. It's not surprising that many of these Ikea shoppers would be Zipcar members, and therefore it seems reasonable that Ikea would reserve six prime parking spots at its new Brooklyn store for Zipcars. Now, wouldn't it make even more sense to actually store the Zipcars in the Ikea parking lot? Sure, Red Hook is a schlep, and if you planned a furniture-buying trip you'd probably want to reserve a Zipcar ahead of time from a location close to you. But what about spontaneity? What if you were riding the B61 and decided to stay on for a few more stops and check out some furniture, or what if you planned a day of hanging out by the old docks and eating Swedish meatballs, but then, you decided you had to have that supper-classy LMAO bookcase, and it's much too big to fit on the bus. Wouldn't you want at least the possibility of calling up to see if there are any Zipcars available nearby? And don't they think that maybe they'd get some business from the projects as well, people who don't want to schlep over to Bond and Union? I thought Zipcar was supposed to be all about convenience and spontaneity. This must be just a little too far to stretch their minds around. Following Ben Kabak's lead, I have added the Stewart Airport Rail Link to my Spreadsheet o'Boondoggles. In this, I agree with Jeff Zupan, who was paraphrased by the Sun as saying that "the real benefit of Stewart International Airport would be if it relieved the city airports of upstate residents who would no longer have to commute into the city to fly." None of the rail proposals would serve very many upstate air passengers. With AirTran cancelling its flights out of Stewart, Ben observes that there's even less reason to invest scarce transit funding in enabling this airport. Following up on an earlier article about the tradeoff between funding air and rail travel, I feel that government money spent on air travel deprives passenger rail carriers of needed revenue and ensures that they will continue to need to beg for subsidies. My parents regularly fly to Florida through Stewart. They've tried driving the entire way, and they've tried taking the train the entire way. They've told me that flying out of Stewart is so much more convenient than either of the other options. But would the train be more attractive if they had to fly out of Albany or one of the other airports? Incidentally, there used to be a privately-operated bus called the Hudson Valley Airporter, which traveled down the Thruway and Route 9 to Kennedy and La Guardia. It was active in the 1980s, gone in the 1990s. Stewart Airport opened in 1990. Coincidence? Here's an idea: imagine if we extended the Empire Corridor train service from Rhinecliff, Poughkeepsie, Croton and Yonkers through Penn Station to Kennedy Airport. There are only two obstacles. The first is that the ex-New York Central Hudson Line and the LIRR Main Line have incompatible third-rail electrification systems. This could be dealt with by stringing catenary the whole length, but it would be expensive. Another option would be some kind of dual-mode locomotive that could switch shoes. The second obstacle is that use of the Rockaway Cut-Off has been blocked by local residents, and the MTA has allowed the tracks to decay. Anyone care to give a back-of-the-envelope calculation about how much it would cost to restore the Rockaway Cut-Off? To deploy catenary along the route? To produce dual-mode locomotives like this? Any chance that this is under $600 million dollars? Staten Island has a rail line, but it used to have three. In addition, the Bayonne Bridge was built to handle light rail, a capacity that has never been used. There's fairly broad support for reactivating passenger service on the North Shore and West Shore Lines. So far, so good. What bugs me is that they keep talking about "light rail." It's in the PlaNYC 2030 documentation, and in a Staten Island Advance article discussing a grant won by Senators Schumer and Clinton (one of the few things that those two have gone out of their way to do for transit). The Third Rail, were heavy rail, though. Saint George was the New York terminus for the Baltimore and Ohio Railroad. Long-distance and commuter passenger trains, and freight trains, came from New Jersey over the Arthur Kill Bridge and the North Shore Line to the ferry at Saint George. You would expect the proposal to be for either commuter rail like the Metro-North Penn Station Access project, or metrorail like the TriboroRX proposal. But no, it's all light rail, light rail, light rail. There doesn't seem to be any justification for preferring light rail over any of the other potential modes. There are two explanations I can think of. The practical one is that New Jersey Transit's Hudson-Bergen Light Rail could go across the Bayonne Bridge, but what would it connect to? Probably the West Shore line, so that should be light rail. But why the North Shore Line as well? Hm, maybe energy efficiency? Staten Island is considered to be too sprawly to support commuter or metro rail (and everyone conveniently forget about the SIRT), so we shouldn't put heavy locomotives on those lines? Mainly, though, I think it's a fad. Light rail is a buzzword that's been going around. All the cool cities are doing it. New Jersey's got one. The only thing cooler would be if we had one of those BRT things that the kids are always talking about. Fads are not a good reason to choose a transit mode. The residents of Staten Island are going to be using this thing for years to come. This would be like the subway cars that still have the fake wood laminate - don't you love being saddled with what someone thought was cutting edge in the 70s? - except that it would actually matter in terms of speed and connections. Staten Island is the borough closest to the west side of the Hudson, and has the potential to be closely connected with the continental rail infrastructure. Right now to get a train to Philadelphia you have to take a bus or train to the ferry, then a subway uptown to Penn Station. With a connection to the Hudson-Bergen light rail, you could get to Hoboken or Journal Square and then get a train to Newark and another to Philadelphia. Meanwhile, with the North Shore line revived as heavy rail, you could get a commuter train directly to Elizabeth, Newark - or even West Trenton and Philadelphia. From a commuter point of view, you could connect to the Northeast Corridor at Elizabeth and transfer at Newark to a train to Penn Station. You could get to some of the many jobs in New Jersey. We're still doing the studies. I think we'll find that light rail makes sense for the West Shore line, but heavy rail for the North Shore Line. But why don't we do them without making up our minds ahead of time about the mode? TriboroRX: Is the capacity there? In discussing the TriboroRX proposal, I have serious concerns about the capacity of the right-of-way to handle this amount of service. Right now the Bay Ridge Branch and the New York Connecting Railroad are single-track freight lines in many places. Of course the proposal is to increase it to two tracks and possibly four where there's room. In fact the Bay Ridge Branch and the NYCR were originally four tracks for part of their length and can fit three, if not four, from the Brighton Line (Q train) to Fresh Pond Yard, and possibly even six for part of the right-of-way west of the Culver Line (F train). But the rest of the line, from the Culver Line to the Brighton Line, and from Fresh Pond Yard to the junction with the Amtrak line to Penn Station in Woodside, is two tracks, and even if the right-of-way could fit another track here or there, it would be expensive to expand the bridges and tunnels. The problem is that these lines are still used for freight trains, and unless they're expanded to three tracks for the entire length, they will need to share the tracks. It's not unprecedented for transit and freight service to use the same tracks: New Jersey Transit's River Line between Camden and Trenton shares tracks with Conrail freight. However, New Jersey Transit has an agreement with Conrail that the passenger trains will only run from 6AM to 10PM, except Saturday nights. That might work in South Jersey, but it would be difficult in New York City, even in Maspeth. But let's suppose that it was worth running passenger service just for the daytime and evening use. The River Line is a secondary freight route, and only runs a few trains a night, and the Bay Ridge Branch is even more lightly used. Good, right? Wrong. There is a proposal for a Cross-Harbor Rail Freight Tunnel to connect the Bay Ridge Branch with the Greenville Yard in Jersey City. Currently, rail freight going from New Jersey to or through New York City needs to either be floated across the river on barges, or hauled over 150 miles north to the bridge at Selkirk and 150 miles back south. In practice, it's cheaper and easier to transfer the freight to trucks and drive it over the bridges. Of course that wears down and clogs up the city's bridges, highways and streets, pollutes the air and increases traffic carnage, hence the need for the tunnel. According to the Draft Environmental Impact Study for the tunnel, insted of eight train trips a day, there would be 24-64 freight train trips using the Bay Ridge Branch per day (page 8-69 of this PDF), depending on whether one or two tunnels were built. The DEIS is very unclear on the anticipated number of train trips on the Hell Gate Bridge, but the total number anticipated for LIRR destinations (i.e. all other destinations) is 13-15 per day. It sounds like that means we'd see 11-49 trains going over the Hell Gate Bridge, but I can't figure out whether the prediction is closer to 11 or to 49. I'm going to assume the most extreme scenario of 49 trains a day; it's still less than four an hour. The TriboroRX proposal also doesn't take into account the plans to run Metro-North trains from New Haven to Penn Station via the Hell Gate Bridge. This would run five trains an hour in each direction during peak hours, a substantial addition to Amtrak's current ten trains per day. Hell Gate: Amtrak, Metro-North and freight trains could fit two tracks if the freight trains are all run on off-peak hours, leaving two tracks for TriboroRX service. Some Metro-North trains could potentially share tracks with the TriboroRX trains to make room for more freight or Amtrak trains. NY Connecting Railroad: Requires widening, time-sharing or commuter rail. Bay Ridge Branch from Fresh Pond to Brighton Line: Freight trains can run in one or two tracks, leaving two tracks for passenger service. Bay Ridge Branch from Brighton Line to McDonald Avenue: Requires widening, time-sharing or commuter rail. Bay Ridge Branch from McDonald Avenue to the Brooklyn Army Terminal: Wide enough for anything. Mass Transit Magazine has an interview with San Francisco Muni Executive Director Nat Ford (which I found via the Orphan Road). The most interesting thing about the article is that Muni oversees the public parking facilities in San Francisco, including not only on-street spaces and garages but parking enforcement as well. Ford discovered that the atrocious (70%) on-time performance rates for the bus system were largely due to problems on fifteen lines, and that many of those problems had to do with parked cars blocking bus lanes and stops. Well, Muni has the ability to send in large numbers of parking control officers to those routes and clear up those problems. It seems head-slappingly obvious, and you wonder why nobody thought of that before, but according to the article it only became clear after a comprehensive analysis of the system, which hadn't been done in thirty years. Of course, it seems head-slappingly obvious that if you've got such crappy on-time performance rates you might want to do an in-depth investigation, but apparently Ford's predecessors were happy to tread water. The other mind-boggling statistic was 150 "missed trips" a day. That means 150 times a day, people were waiting at the bus stop and no bus came. Or if a bus came, it was the bus after the one that was supposed to come, and it had twice as many people on it. Ford figured out that this was partly due to the fact that they had 300 bus operators on long-term disability. I'm not sure what he means by "working every name, every person," but I'm hoping that he gently eased them back into work, or out into another job. In any case, it makes perfect sense that with 150 less long-term disabled bus operators to pay, and 150 new ones hired, they're now down to 30 missed trips a day. And here I thought Green Lines had problems. If Nat Ford is ever out of a job, I hope we can find him work at our MTA. The map above is a detail of map of the 1929 proposal for the Independent Subway Second System. I'm posting it to show you the Winfield Spur. 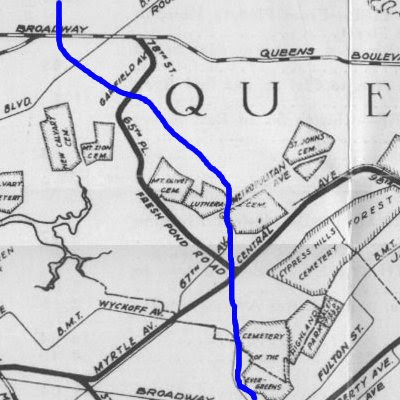 This planned line would have diverged from the Queens Boulevard Line just east of the Roosevelt Avenue station in Jackson Heights, serving Winfield (once its own town within Queens County, now a suburb of Woodside), Maspeth and Ridgewood before merging with the proposed Myrtle Avenue Subway to run along Central Avenue in Glendale and finally run alongside the old Long Island Railroad Rockaway Branch to the Rockaways, the route that the A train now takes - with a new branch through Southeastern Queens. This was never built because, well, you know what happened in October of 1929. However, the First System was built to hook into it, and at the east end of the Roosevelt Avenue station is an upper level platform with two tracks that turn off into a wall. This was designed to provide through service to the Rockaways from midtown, and also to serve the neighborhoods of Maspeth and Ridgewood. It would have been a two track line arising from the Roosevelt Avenue station (the never-used upper level station, but also would have track connections to the main line), and curving southeasterly between 78th and 79th Sts. 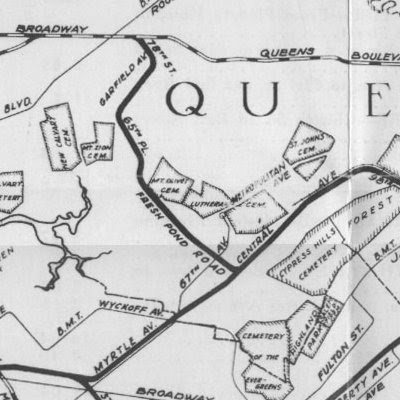 to Queens Blvd., then along the LIRR ROW into Garfield Avenue to 65th Place, then along 65th Place to Fresh Pond Road, and then along Fresh Pond Rd and Cypress Hills Avenue to a connection with the Central Avenue line outlined above. The line would be 2 tracks, and would be subway to 45th Avenue, then elevated to Fresh Pond Road, then subway again to Central Avenue. If this had happened, Winfield, Maspeth and Glendale would have one-seat rides to Manhattan, and would probably look a lot different than they do today. As it is now, they're dependent on cars and buses to the train to get to Manhattan. Digging a subway in Jackson Heights and Ridgewood would probably be a lot cheaper than the Second Avenue Subway, but it would be difficult to justify the expense. However, the Regional Plan Association has endorsed the idea of using the New York Connecting Railroad for subway-type service, and in this area they practically duplicate each other. With my mad graphic skillz I have drawn the approximate route of the NYCRR on the 1929 map. In fact, as Michael Frumin notes, it passes close enough to the western end of the Roosevelt Avenue station that a transfer could be made fairly easily. The TriboroRX plan as envisioned by Frumin and his bosses at the RPA could serve Winfield, Maspeth and Ridgewood, although not as centrally as the planned subway line. It would also not give them a one-seat ride to Manhattan, but rather require them to change at Jackson Heights, Middle Village or East New York. As I've discussed in previous posts, though, it may make more sense to use sections of the TriboroRX right-of-way to run Manhattan-bound subways. In this case, we could dig the tunnel from Jackson Heights to the NYCRR and run one of the Queens Boulevard trains (like the R or the V) along this section of track to East New York, and perhaps further. In addition to a one-seat ride to Manhattan, this would allow residents of Western Queens to travel to East New York and transfer to the A, C, J, L, M, Z or 3 trains to reach other parts of Brooklyn. We could also allow transfers to the M at Metropolitan, but then turn east at Fresh Pond Yard and run the line along the old Montauk Branch right-of-way through Glendale, Forest Park and Richmond Hill, connecting to the Rockaway Branch as in the 1929 plan or continuing on to Jamaica and potentially turning around in the Archer Avenue tunnel. Either way, we'd bring good transit to some previously underserved neighborhoods. Thames River update: your stories wanted! Remember the Thames River? No, not the one in London, the one in New London. The one where Amtrak will be replacing a bridge and thus suspending all service between New Haven and Boston for four days. Not quite all service: there will be at least one train a day over the Inland Route via Springfield, and Shore Line East will be extending their trains to New London (but apparently have no plans to run them on the weekend). Katie Warchut of the New London Day reports that the outage is scheduled for June 14-17. If you have to change your plans because of this outage, the Day would like to hear from you. Ms. Warchut has emailed to tell me that they're interested in speaking with any riders who will be affected by the train outage. How do riders feel about it and what will they do as an alternative? You can email k.warchut@theday.com or pass the address along to anyone you know who is an Amtrak rider. The Tri-State Transportation Campaign reports that the Port Authority is planning to add another bus lane to the Lincoln Tunnel and its approach road. The current counter-flow XBL was instituted in the early 1970s and carries more than 62,000 passengers in over 1700 buses from 6:15-10AM every day, saving those passengers 15-20 minutes over drivers in general-purpose lanes. Sadly, there is no similar lane for other peak-congestion periods, such as the evening rush, or weekend traffic returning to Manhattan on Sunday evenings. Although Tri-State reports that the idea of a second lane was first proposed in the 1980s, it has taken four years of study and will not even be formally announced, let alone implemented, until the end of 2008. In addition to (and potentially slowing down) buses, the lane will also allow cars with more than three passengers, and even single-occupant vehicles that pay tolls. Not exactly the most impressive solution; the car lobbyists must have been fighting this one pretty hard. You'll notice that none of the documentation gives a figure for how many vehicles or passengers the non-XBL lanes carry. What would a real bus priority solution look like? Finally, some Streetsblog commenters have pointed out that many of the bus riders experience a significant wait before they get on to the XBL. The XBL should therefore be extended north and south along the Turnpike and west along Route 3, as far as necessary for the buses to avoid congestion. Bus priority lanes should be considered on Boulevard East, Bergenline Avenue and Kennedy Boulevard as well. In a recent post, I discussed the Regional Plan Association's TriboroRX proposal, and Michael Frumin's research on potential usage. I mentioned that it was not necessarily the best solution to run a single train along the entire route, that it might be better to chop the right-of-way up and use it to extend other lines. In particular, I highlighted the 1969 proposal to re-route the L train to Brooklyn College. I can definitely see value in that proposal: from Wilson Avenue to New Lots Avenue, the L stations are all directly over the cut of the Bay Ridge Branch; the East 105th Street station is three blocks south of the cut, and the Rockaway Parkway terminal is four blocks south. The inconvenience of moving these two stations would be more than compensated by the improved connections. You could conceivably extend the other trains to the west of Brooklyn College; the 2 and 5 trains come to mind. The problem is that those trains already travel much longer distances than the L, taking over an hour to get all the way from the northern edge of the Bronx to Brooklyn College. The situation is similar with the B, the Q, the F, the M and the D trains, but each would require splitting one of the routes as well as extending it - or else abandoning B service to Brighton Beach or M service to Bensonhurst. The L currently takes 40 minutes to go from Eighth Avenue to Rockaway Parkway. It would probably take another ten minutes to get to Brooklyn College, and then another 10-15 to New Utrecht Avenue. Another possibility would be to extend the G train, which takes only 35 minutes to get from Court Square to Church Avenue. It would require tunneling new tracks under the elevated F viaduct from Church Avenue to the right-of-way. From New Utrecht Avenue west to Fourth Avenue, the right-of-way runs right next to the N train (with two unused express trackways in the N right-of-way). It does not make sense to duplicate the N service, unless the frequencies are too low. West of Fourth Avenue, there are two reasons I can think of to run a train to the Brooklyn Army Terminal: jobs and the ferry. If this is desired, then extending the G would probably be the best choice. The L would be extended to MacDonald Avenue, and the G to the Brooklyn Army Terminal. These two extensions combined would do wonders to connect the southern parts of Brooklyn with each other, and with Manhattan. It would go a long way towards making Brooklyn College more accessible to people from all over the borough, and bring new service to the areas of East Flatbush, Flatlands and Brownsville that haven't had rapid transit in many years.